Home / Softub Cleaning & Refilling / Outer Care / 303 Aerospace Vinyl Protectant Trigger Sprayer: 16 & 32 Oz. 303 Aerospace can treat hot tub/spa covers, dashboards, tires, interiors and so much more! 303 Aerospace Vinyl Protectant beautifies your WeatherTex vinyl Softub while protecting it from damaging UV rays with SPF 40. 100% prevention of UV-caused slow-fade with regular use. 303 is non-toxic and environmentally safe. 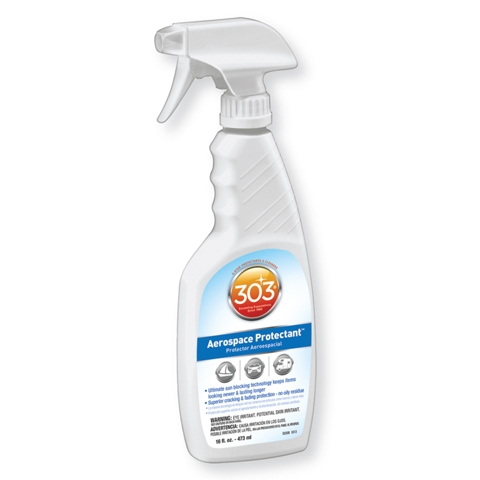 303 Aerospace Protectant is guaranteed when used as directed. Manufacturer’s liability limited to product replacement of refund upon proof of purchase and return of unused portion. General Directions: Spray on and WIPE COMPLETELY DRY. Apply every 3-5 weeks for maximum UV protection. Interior/Exterior: Vinyl & leather interiors, plastic bumpers, fender flares, trim and lenses, car bras, tonneau covers, vinyl soft tops & plastic windows, chrome and alloy wheels. Spray on and WIPE COMPLETELY DRY. Synthetic & Natural Rubber: For inflatable boats, wet/dry suits, tires, door & trunk seals and under-the-hood rubber. Spray on, wait 5 minutes and WIPE COMPLETELY DRY. RV EPDM Rubber Roofing: Clean surface. Spray or mop on 3 x 3 foot area. WIPE COMPLETELY DRY. For your safety, never walk on wet roof. Fiberglass: RV’s, boats, truck caps. Out of direct sun, spray surface with 303 and wipe completely dry. If streaking occurs, too much product has been used. Use a wet towel to remove excess, IMMEDIATELY WIPE COMPLETELY DRY. Motorcycles/ATV’s/Snowmobiles, PWC’s. : Spray on, wipe dry & polish to a high gloss. Also for gear helmets, visors, goggles. Repels dirt, insects, snow ice and road grime. Household: Patio furniture, spa and pool covers, vinyl liners and pool inflatables. For vinyl and leather furniture, jackets, handbags, golf bags. Not for unfinished leathers (such as suede), fabrics (canvas) or floorings.